Although I love the new generation of female vocalists out of Senegal - ladies like Viviane and Aby Ndour - there's still a special place in my heart for the "first generation" of singers to break into the masculine world of mbalax back in the late '80s and early '90s. 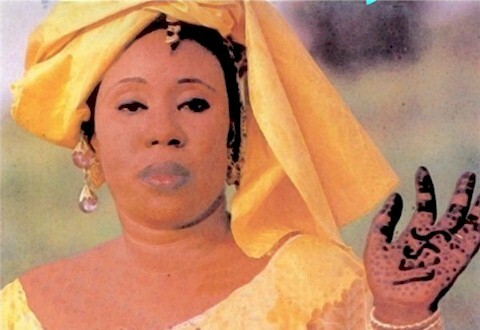 Although Kiné Lam is generally acknowledged to be the "queen" of mbalax, if she has one rival for the title, it would probably be Daro Mbaye, who has a vocal style that is even wilder and more over the top than that of the great Kiné. I can't tell you a whole lot about her. She is from the city of Luga in the north of Senegal, and like Kiné Lam has been a member of the Sorano National Theater in Dakar. Daro has toured throughout the world, both on her own and with Doudou Rose Ndiaye's acclaimed percussion company. Unlike a lot of cheapo Senegalese cassette productions, Daro Mbaye's debut Doylu (Ibou Touré 121056, ca. 1990) was recorded with a full compliment of wind instruments in addition to the requisite guitars, percussion and synthesizer. Unfortunately, it seems my copy is a pirate edition, so in addition to being oddly jerky and sped up all of the instruments sound like synthesizers anyway. No matter: I once drove to Chicago in the middle of a snowstorm with it cranked up full-volume on the sound system - a strange, surrealistic experience! Here are four tracks (out of seven) from Doylu - blow your own mind! Daro's career seems to have gone on hiatus in the last few years, although she occasionally performs in Spain, where her son Sidy Samb lives. He's a rising musical star in his own right. You can see some videos by him here, here and here.